How to get The Last Word in Destiny 2. 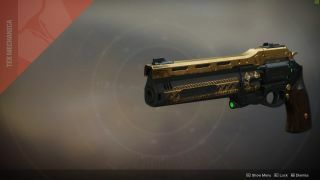 To the delight of Destiny veterans, The Last Word Exotic hand cannon is now available in Destiny 2 for players who own the annual pass. The Black Armory expansion is all about crafting the finest weapons of humanity's Golden Age, so it only makes sense that this iconic revolver would return. The Last Word is the fastest-firing hand cannon in the game, and you can even fan-fire it like friggin' McCree. It's a cool, powerful, beloved weapon, designed to dominate shotgun rushers in PvP, and it's well worth owning. In this guide we'll explain how to acquire the weapon, offering tips to take the pain out of some of the steps required to complete its Exotic quest, which is called 'The Draw'. Visit the Tower and talk to the Drifter. He'll give you a Hive artifact which you'll need to upgrade multiple times by feeding it energy and materials, starting with the life force of lots of Hive. For the first step, you need to kill 75 Hive enemies plus three Hive bosses, and you'll need to kill a boatload of Hive with solar damage. Between Escalation Protocol and the Northern Lost Sector, Mars is the best place to kill Hive, so head to the Red Planet and pop some heads. The solar kills take the longest, so equip your strongest solar guns and abilities at the start. The Avalanche LMG that was handed out during The Dawning event is a good choice. Blade Barrage, bottom tree Dawnblade, and top tree Hammer of Sol are all good Supers, and any solar energy weapon will do the job. For exotics, try Sunshot, Prometheus Lens, Hard Light, Skyburner's Oath, or Polaris Lance. Helpful exotics include Ophidia Spathe for extra fiery knives, Hallowfire Heart for fast-recharging Titan abilities, and Sunbracers for Warlock solar 'nade spam. You knew this was coming: it's time for the Crucible part of the quest. The first Crucible part, actually. Yes, there's more. But it's really not that bad. For this step, you need to fill a progress bar by getting kills in the Crucible. The kicker is that dying will set you back, so you have to go positive. Happily, assists help, so be sure to travel in a pack and tag as many opponents with your primary as possible. You can get kills with anything, so as long as you keep your KDA above water, you'll finish this step eventually. Just group up, pick your mode of choice (not Rumble as you won't get many assists), and play relatively passive. Godspeed. Made it through? Good. Now it's time for a much easier mission. Once you finish your Crucible kills, head to the Rig landing zone on Titan. You'll see a mission marker on the map; select it and follow it to a Lost Sector on the north side of the Rig. The mission power level starts at 500 and scales to your level, so you'll be fine. Make your way to the heart of the Lost Sector and you'll find a souped-up Hive Acolyte guarded by two Wizards. To drop the Acolyte's shield, you'll have to kill the Wizards first. So, you know, shoot everyone. Once everyone's been shot, it's back to the Drifter. The good news is that you can get the Hive Larvae and Etched Crystals by spamming the normal version of the Lost Sector you did in step three. Seriously, just do it 15 times and spawn back on the Rig after each attempt. Once you get enough Larvae, you can ignore the little dudes and just melt the boss to speed things up. The bad news is that the Hive Ritual public event only spawns on Titan in the Rig and the southern sector of Mars,where it's a pretty rare event due to people firing up Escalation Protocol. So, while you're farming Larvae and Crystals, keep checking the map in those locations to see if the Hive Ritual event is incoming. This event spawns near the Rig landing zone on Titan and in the top part of the Southern sector on Mars. If you finish the Larvae and Crystals before you finish the Hive Rituals—which you probably will—go ahead and move onto the Crucible medals and periodically check the map for events. Almost done. Head back to the Drifter and he'll give you a new artifact called The Conversation. This unlocks a new mission in the Tangled Shore, in which you'll have a very loud chat with a Hive gunsmith named Enkaar. Set down at Thieves' Landing and head south until you reach the mission marker. Most of the mission needs no explanation. If you've killed Hive before, you'll know how to proceed: kill dudes, insert Worm A into Wall A, kill wizards, kill crystal. Standard stuff. It's after you kill that crystal that things pick up. You'll find yourself in the Broodhold and you'll see a runic plate. Standing on the plate fills a progress bar, and when the bar is full, The Last Word appears. But it's not yours yet; you've got to kill Enkaar first. Enkaar will spawn in front of the plate around the time you grab The Last Word, and shortly afterward, he'll draw his gun. You guessed it: you've got to shoot his gun out of his hand using The Last Word, and you've got to do it before he blasts you. How cool is that? It's high noon! There are three plates in the Broodhold, and each plate comes with an extra clone of Enkaar for you to duel. The first plate is unlocked from the get-go, but to use plates two and three, you'll need to clear out the enemies that spawn, taking particular care not to get blown up by the Cursed Thrall. Apart from that, it's standard procedure: stand on the plate, fill the bar, grab The Last Word, and shoot Enkaar's weapon when it glows. Note that the clones fire in the order they spawn, and if you're too slow, you will die, so channel your inner Clint Eastwood. Make your way to the third plate, shoot all three Enkaars in the blaster, and claim The Last Word. It's officially yours. Congratulations! You'll find that The Last Word is a joy to use in the Crucible—remember it's intended to be used in close range, fired from the hip rather than ADS— so if you're not sick of PvP, go give it a test run.